A ceremonial train carrying Minister of Finance Mangala Samaraweera, Minister of Transport and Civil Aviation Arjuna Ranatunga, State Minister Asoka Abeysinghe, Former Minister of Transport and Civil Aviation Nimal Siripala de Silva, Members of Parliament Chamal Rajapaksa, Mahinda Amaraweera, Governor of the Southern Province Keerthi Tennakion and a host of other local politicians and representatives of Chinese government and contractors left Matara Station for Beliatta at 9 a.m. on Monday commissioning the Matara-Beliatta railway extension. 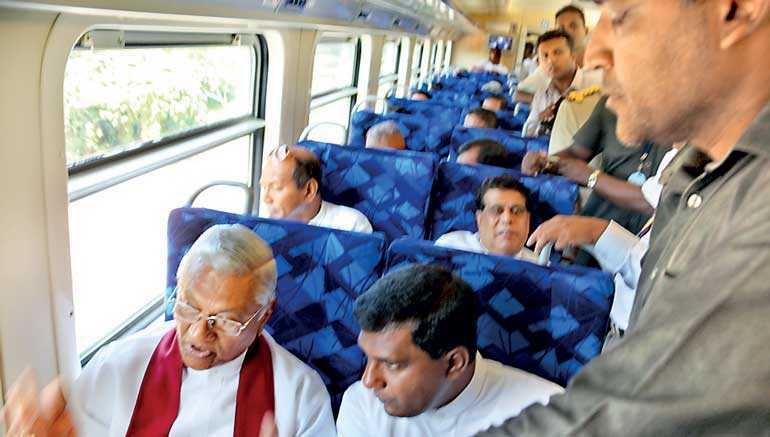 Minister Ranatunga had taken a cue from the public protest he faced when joining the first test run held on 6 January and had invited former President Mahinda Rajapaksa and all local politicians to attend the function. Former President Rajapaksa was represented by his brother Member of Parliament Chamal Rajapaksa. 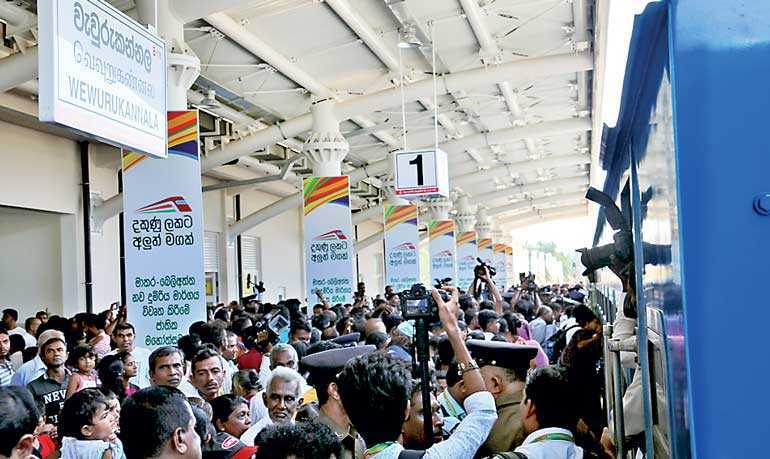 The ministers and other dignitaries disembarked and unveiled ceremonial plaques at sub-stations at Piladuwa, Werahena and main stations at Kekanadura, Bambarenda, Wewurukannala and Beliatta. Large crowds lined the 26.75 km railway track and stations and cheered as the train passed by. 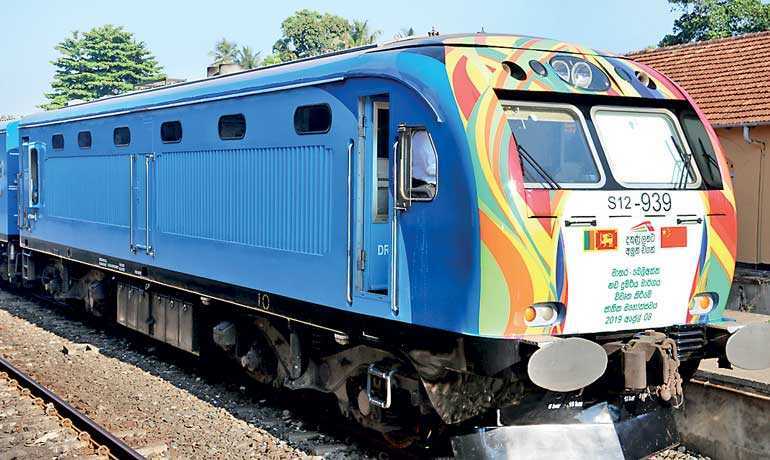 Supporters of former President Mahinda Rajapaksa greeted the train at Beliatta shouting ‘Mahinda mahathayaya jayawewa’ and later strung a banner across the engine. 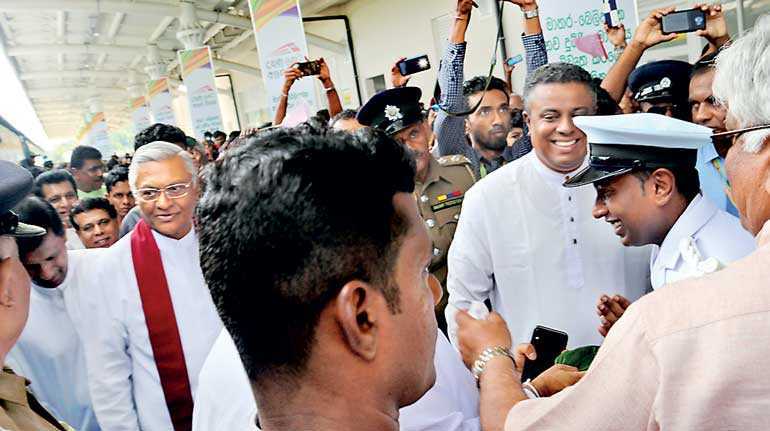 Addressing the public meeting held at Beliatta which commenced after chanting of Sri Lanka and Chinese Buddhist stanzas, State Minister of Transport and Civil Aviation Ashoka Abeysinghe said that a railway line beyond Matara was envisaged by President Ranasinghe Premadasa in 1991. He said that the Government appreciated the initiative taken by President Rajapaksa to complete the project. Former Minister of Transport and Civil Aviation Nimal Siripala de Silva said that during his tenure he had initiated a feasibility study for phase two of the project from Beliatta to Hambantota and finally to Kataragama and hoped that the present Government would make it a reality. 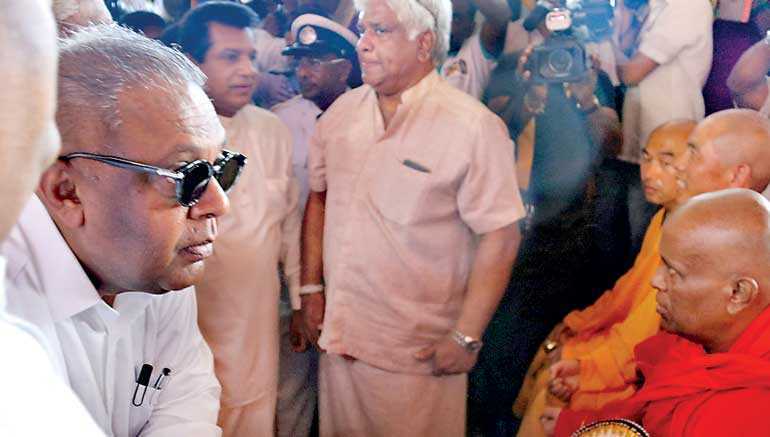 Member of Parliament Mahinda Amaraweera a former Minister of Railways reiterated that it was a public necessity that the railway line be extended up to Kataragama and pledged the fullest cooperation and support. Former Speaker Chamal Rajapaksa said that this project was a boon to the future generations and said that former President Mahinda Rajapaksa wanted his wishes conveyed. He also echoed the words of the earlier speakers and requested that it was imperative that steps be taken to extend the railway to Tissamaharama and Kataragama. State Minister Dilip Wedarachchi said that the people of Hambantota district can boast of having an international airport, a harbour and now a railway. He thanked all those who initiated the projects and said that the people should welcome development irrespective of political affiliations. 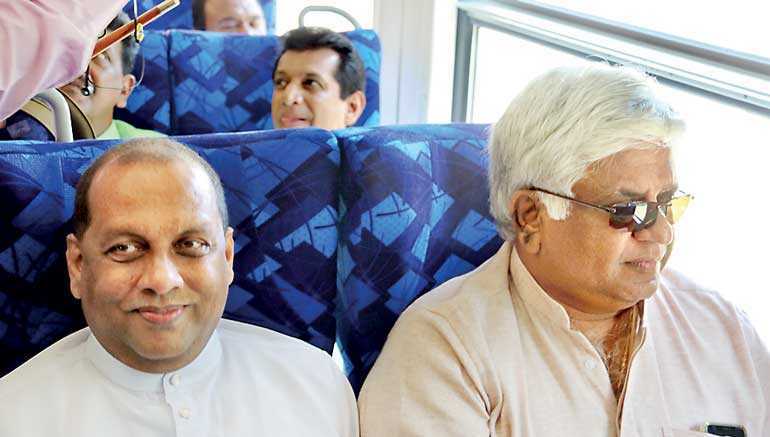 Minister of Transport and Civil Aviation Arjuna Ranatunga addressing the public gathering said that both President Maithripala Sirisena and Prime Minister Ranil Wickremesinghe wanted train services to Beliatta operative before the Sinhala and Tamil New Year even if both of them were unable to attend a function held before the New Year. He also said that the Ministry would take all steps to make the railway extension beyond Beliatta a reality in the near future.